Add any combination of vegetables to the parcel but be sure to cut them all to the same size so that all are cooked at the one time! To prepare the parcels, firstly cut some parchment paper into A4 size pieces. Gently place one piece of fish in the centre of each piece of the parchment paper. 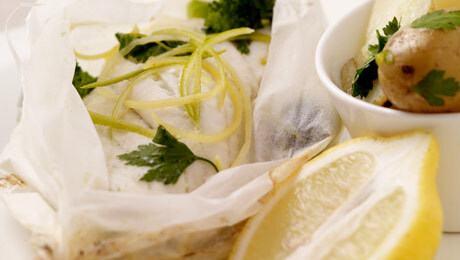 Thinly slice 1 lemon and place a slice or two of lemon on top of each fillet and sprinkle over some parsley. Drizzle one tbsp of olive oil in each parcel. Meanwhile, in a pan, bring some salted water to the boil and add the spears of broccoli, and boil for 5-10 minutes. Strain the broccoli and add to the fish parcel. Fold the parchment paper over from each side and twist either end, much like a Christmas cracker ensuring the fish is fully sealed in. Preheat the oven at 180°C/350°F/Gas Mark 4. Place the baby potatoes into a pan and barely cover with cold water. Bring to the boil, and simmer for 20-30 minutes or until the potatoes are cooked through. Drain the water from the pot and toss in 20g/¾ oz of butter, some parsley, and seasoning. Keep warm until the fish is baked. Bake the parcels in the oven for 15-20 minutes. To serve, place the paper parcel on the plate and add the broccoli and baby potatoes, serve immediately.